Blombos Cave drawing with ocher pencil on silcrete stone. Interior of Blombos Cave, where the drawn-on rock was found. The drawing isn't what you'd call elaborate; it's a row of crosshatched lines along the smooth face of a rock that may have been a tool for making ocher. In fact, the red lines were made with red ocher. The pattern (with a little imagination) resembles a hashtag. What's remarkable is that it was apparently made about 73,000 years ago. That's tens of thousands of years older than similar drawings made in European caves. 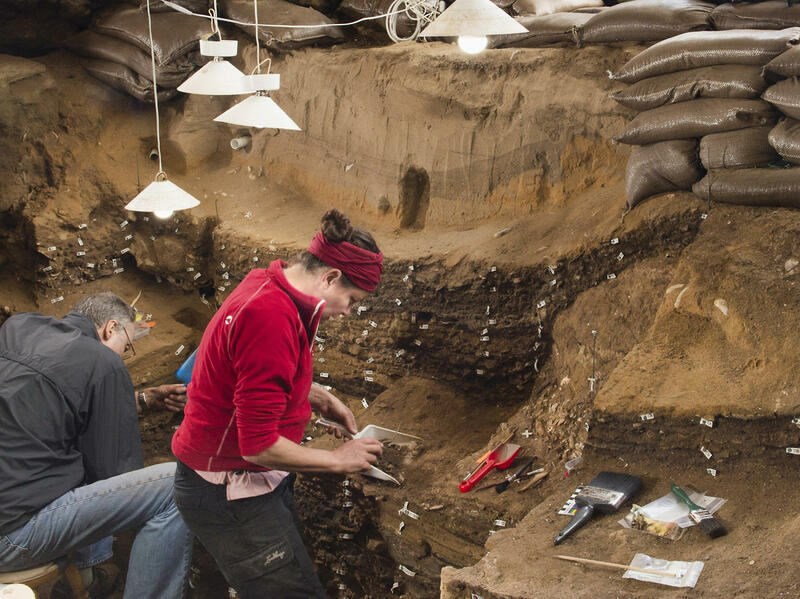 The researchers, led by Christopher Henshilwood of the University of Bergen in Norway, have previously found a sort of toolkit for making ocher at the site, known as Blombos Cave, that dates back 100,000 years. That evidence shows that early Homo sapiens were clearly making ocher a long time ago, though for what purpose is unclear. 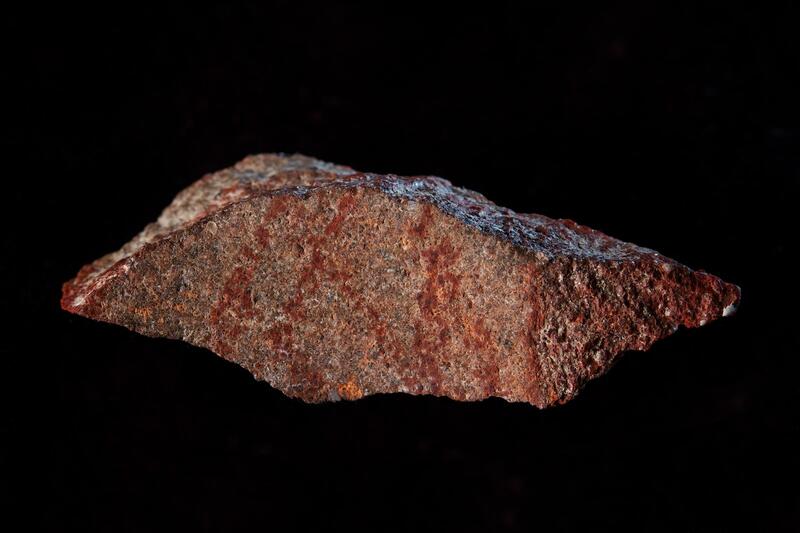 And they've found a piece of ocher from about 70,000 years ago with engraved crosshatching on it. It now seems that they weren't just scratching marks onto things, but also drawing on stone with ocher. "Our microscopic and chemical analyses of the pattern confirm that red ochre pigment was intentionally applied to the flake with an ochre crayon," Henshilwood and his team explain in the journal Nature. To test their idea, the researchers made up a batch of ocher and used a wooden stick to paint it onto a similar shard of rock. They also made an ocher "crayon" and used that as well. The drawn lines matched the crayon application most closely. The researchers say that's an interesting distinction, suggesting that a crayon might have lasted longer, while ocher "paint" would have been prone to drying up quickly. Research team member Karen van Niekerk, also from the University of Bergen, says these lines appear to be more than just random doodling. "The archaeological layer in which [the drawing] was found has yielded other indicators of symbolic thinking, such as shell beads covered with ochre and, more importantly, pieces of ochres engraved with abstract patterns," she writes in the journal Ecology & Evolution. These people used different techniques and media, she says, supporting the hypothesis "that these signs were symbolic in nature and represented an inherent aspect of the spiritual wold of these African Homo sapiens," says van Niekerk.